The Porsche Centers in Los Angeles and Atlanta aren't just big, they're the brand's largest facility investments outside of Germany. Two hundred and fifty thousand people have visited the two centers, and are proving that immersive retail works. The Porsche Centers include fine dining, racetracks, off-road courses, and a lot more, giving the fullest Porsche experience. Getting hands-on with the product doesn't just encourage already interested consumers, it helps demonstrate that Porsche ownership is just that; an experience. Per Klaus Zellmer, President and CEO of Porsche Cars North America, Inc. “Porsche stands for superb design and engineering, but also for a superb experience. Getting people behind the wheel in a place where they can really test the performance is the best way to connect them with the Porsche brand.” For younger consumers, showing that the Porsche brand is about a lifestyle and not just a product is a major attraction which brings them into the fold. A visit to the center includes, at minimum, a 90 minute driving experience on or off-road, coached by professional drivers. Visitors can sample all major models from the 911 to the Cayenne and Panamera, and those too young to drive can experience the cars in a simulator lab. The latter part is key, because the average Porsche Experience Center visitor is seven years younger than the average Porsche buyer. In addition to the driving experience, the Centers include Porsche retail stores, striking architecture, classic sports cars on display, and fine dining. As younger people tend to prefer experiences to products, this sort of access to the Porsche brand helps to expose the company's products to a new generation in a natural way. Of course, if you're the sort of person who has a producer, you can torture them at a Porsche Experience Center as well. The centers also feature fine dining, Porsche retail stores, classic sports cars on display, and striking architecture, but that only scratches the surface. At both the Atlanta and Los Angeles locations visitors can also order and take delivery of custom-specification models. The Atlanta location also includes a Porsche Classic workshop, where Porsche Classic technicians and experts can work with owners to service classic Porsche models. The Atlanta Experience Center is located ten minutes from the Atlanta airport, the world's busiest. The facility offers a module-based, 1.6-mile driver development track, racing simulator lab, Heritage Gallery, Porsche retail store, Porsche Exclusive Manufaktur Studio, Business Center and Restaurant 356. 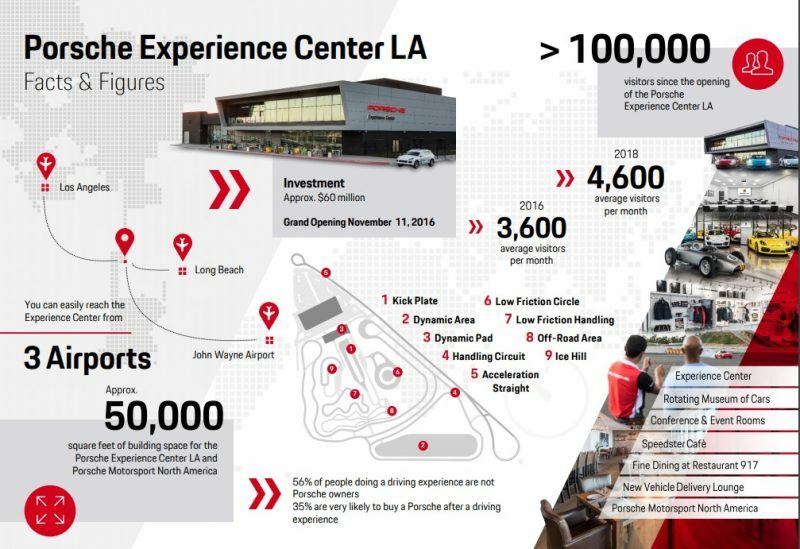 LA’s Experience Center is accessible from three major LA-area airports. The facility features a 4-mile driver development track, events and meeting room space, simulator lab, retail store, Porsche Exclusive Manufaktur Studio, New Vehicle Delivery lounge, Speedster café and Restaurant 917.